Shattered Heart, one of RuneScape's 'Distraction & Diversions', is a members-only feature that allows players to trade 'Strange Rocks' for experience in the relevant skill. Whilst training your non-combat skills, you may notice that a 'Strange Rock' has suddenly appeared in your inventory. These rocks are remnant from the Second Age, surviving artefacts from times of turmoil and war between the Gods. Can you find all the pieces of the Shattered Heart, and rebuild the forgotten statue of the mage Dahmaroc? To start Shattered Heart, you must train any non-combat skill (excluding Dungeoneering) until you receive a 'Strange Rock'. You can either take this rock to the Varrock Museum for experience in the relevant skill, or you can continue training and collecting rocks. There are two rocks available for each skill, and you will not be able to obtain any more rocks if you already have two for that skill. If you wish, you can add the two rocks in a skill at the same time. Note: The final two rocks can only be added once per week. Agility Complete any of the Agility Courses. Single obstacles and grappling do not work for gathering rocks. Construction Build furniture on hotspots or as a flatpacked items in your Player Owned House. Cooking Cook Fish. No other cookable item will work. Crafting Make any leather, d'hide or gold items. Throwing pottery and making Molten Glass will also work. Farming Harvest Hops, Herbs, Flowers and Vegetables The crops must be fully grown and alive. Fletching Make Unstrung bows and Crossbow Stocks. Stringing bows will not work. Fishing Fish with any net or cage. Firemaking Light fires with a Tinderbox. Barbarian Firemaking will not work. Herblore Clean herbs or create completed potions. Barbarian Mixes do not count. Hunter Complete any non-activity form of Hunter. Mining Mine any ores. Mineral Deposits from the Living Rock Caverns can also be mined. Runecrafting Crafting Runes from Rune Essence or Pure Essence. Smithing Smelt or Smith any ores, bars or cannonballs. Thieving Pick pockets, loot chests and steal from market stalls. No other form of Thieving will work. Woodcutting Cut any tree or ivy, or use the Sawmill. 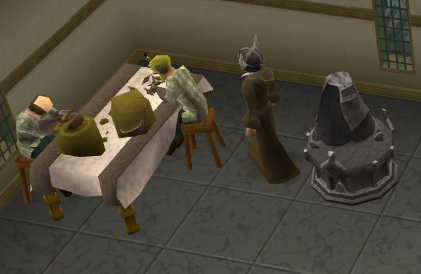 To rebuild the statue, take the Strange Rocks to the Research Team near the plinth in Varrock Museum. Just tell them about the rocks that you have found, and they will give you experience in return for the rocks that you have found, and eventually you will see the statue starting to take place. The first time you complete the statue, you will be given Museum Kudos as well as the experience reward. The only reward for completing Shattered Heart after the first time is experience, but the entire diversion may be complete multiple times, for more experience. You are awarded experience based on your current level in the skill that you obtained the Strange Rock in. You are also awarded experience per rock, so if you have collected two rocks from one skill, you will be able to collect the reward twice. After completing the statue for the first time, players will receive a statue plinth that can be used to build a replica statue in the study of their player owned house. Each subsequent time the player completes Shattered Heart he or she will earn another replica piece to add to the statue. It takes 30 replica pieces to complete the statue.